Cliftonville manager Barry Gray hopes his side can make amends for an under-par performance in a 2-0 defeat by Coleraine in August when the sides meet in the league at Solitude on Saturday. The Reds have won their last four Premiership games to move up to fifth place in the table while the Bannsiders remain unbeaten in the top flight. "We went there earlier in the season and had a real off night," said Gray. "So there is a lot of unfinished business from the boys' perspective. "We will be looking for a similar performance and work ethic like we have shown in the last few games and if we do that we have a chance of winning," said the Reds' boss, whose side have been successful in their last six matches in all competitions after a sluggish start to the season. Having beaten Linfield 2-1 at Ballycastle Road last week to open up a five-point gap at the top of the table, Coleraine suffered a first domestic reverse of the season when they went down 3-2 to Crusaders in the last 16 of the League Cup on Tuesday. 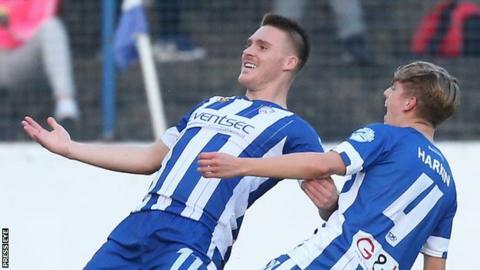 Coleraine manager Oran Kearney has moved to strengthen his midfield options by signing ex-Kilmarnock midfielder Martin Smith on a short-term deal as his his club's injury list continues to lengthen. In Saturday's other 15:00 BST kick-offs, Ballinamallard United host Carrick Rangers in an important encounter at the bottom of the table, while second-placed Glenavon entertain Ballymena United. "Ballymena have come on leaps and bounds under David (Jeffrey) and it's going to be a difficult game," said Glenavon manager Gary Hamilton, whose side crashed out of the League Cup 4-0 to Ards in midweek. "We must have the right attitude to put that defeat by Ards behind us. If we don't and we show any signs of how we played on Tuesday, we'll be on the end of another bad result," added the Lurgan Blues boss. "Glenavon are playing exceptionally well and all we have to do is remember the start of the season when they pummelled us and took us apart in the second half," recalled Jeffrey. "They had a great victory at Crusaders last Saturday - to go there and win is most impressive - so it's going to be tough, but we'll give it our best shot." In the day's late kick-off at 17:30 BST, Dungannon Swifts are at home to a Glentoran side who have suffered losses at the hands of Crusaders and Cliftonville in their last two home outings, with a win over Ards sandwiched in between. "People keep saying we need to bounce back but I'm not panicking. We are exactly where I expected us to be and we still have everything to play for," explained Haveron, who is without the injured John McGuigan. "We started the season well and it lifted expectations but I'm realistic as to where we are with things. There has been a lot of progress made and I want to continue building on that. "We are moving in the right direction and I'm not going to get panicky because we have lost to two quality sides," added the former Coleraine and Ballymena United midfielder. The Swifts have injury concerns over defender David Armstrong, who has missed the last three games with an ankle knock, Liam McMenamin, Cormac Burke, Grant Hutchinson and Seanan Clucas. Linfield play Crusaders at Windsor Park on Monday evening.